Change is hard, but it can be a good thing. For over four decades people in Payson have known exactly who to call when their air conditioner or furnace wasn’t working… Moore Sheet Metal. Moore Sheet Metal has been a leader in Payson’s heating service and air conditioning repair industry 1969, but the time has come for them to close. As a part of their HVAC service and installation team, Robert Moore has been taking care of customers for 30 of those years. Growing up in the family business, Robert learned every aspect of the heating and air conditioning industry. “I learned the importance of quality from my father. I was four when he started Moore Sheet Metal so I grew up watching him and learning the business from him.” Robert states. “I cut my teeth on swamp coolers when I was a kid, and have worked on pretty much everything else since then. Dad taught me to never give the customer less than my best work. Do every job as if it was your own home and treat every customer how you would want your family treated. 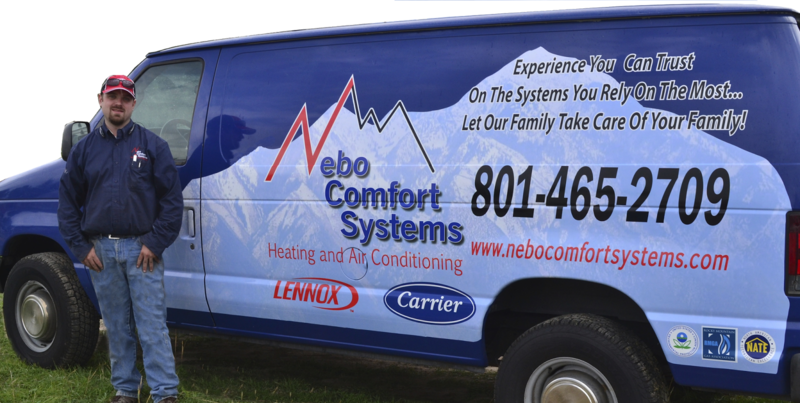 That has been a guiding principle my whole life.”A new name, at the same number, and with the same great service is Nebo Comfort Systems motto. taking care of customers in the office. Heading their installation team is son in law, Joshua Warren. Like many of Moore’s employees, he started working for the family business in high school and grew up with those same high expectations of quality service. “Experience and trust are key factors in customer satisfaction,” Robert adds. Serving Southern Utah County for over 30 years. Let our family keep your family in comfort! All makes and models: Lennox, Tempstar, Carrier and many more. Serving communities throughout Utah, Salt Lake and Juab counties, but the heart of their business always has been and always will be in the Payson area.